When seperating multiple e-mails in the e-mail part of kolabnow you can seperate them by a semicolon. When doing the same in the "participants" part for new events it doesn't work. Put a semi-colon right after the first without clicking "add participant". Both participants appear in the same slot/row for the participants. 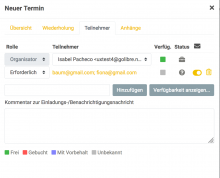 After adding the first participant and pressing comma, semi-colon or space bar the e-mail is put into a box like when doing the same thing for creating an e-mail. After pressing "add participant" the two participants are shown seperately as if you pressed "add participant" after each participant. I agree. Separation by semicolon should also work in "add participants". No I would not want this. The idea is to see the availability of each participant on his own, so it is useful that the participants are listed one below the other, don´t you think? You would type the names seperated by a comma into the field, click on add participants and get two new rows. For each row you can then see the availability. I agree that it would interfere with the option to see availability. 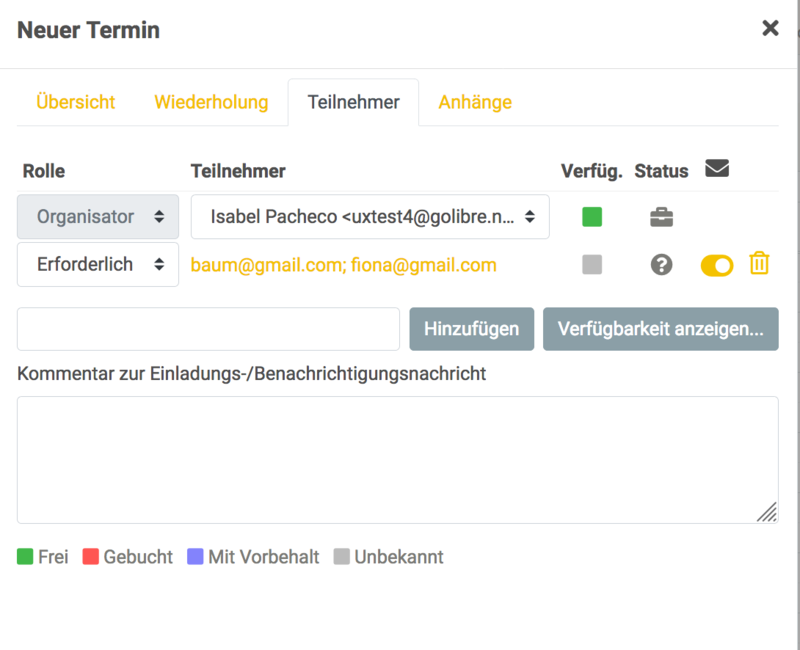 It wouldn´t make sense to be able to have multiple addresses in a row, after entering them. Yes, exactly. The semi-colon should separate them. I mean so that when you enter an e-mail address and then put a semi colon, it automatically "finishes" the participant and adds it as one and then you can add another one OR when you seperate them by semi colons and then press add it splits them up into separate participants. The photo is how it is now, not how it should be.